YouTube, "Walk, Sister" by Nan Thompson. Performed October 14, 2018, at Making Strides Against Breast Cancer, Rochester, NY. Live video recording, courtesy Bill Fowlkes. YouTube, snippet from "What's Keeping You From Singing?" by Elizabeth Alexander. Spring 2017. Photo courtesy Bill Fowlkes. Thank you for visiting our website. We hope you find it informative. We also hope you'll join us in the joy of making music at our next concert. You can visit us on Facebook at the Rochester Women's Community Chorus. Please "like" us to receive notices about our concerts and events in your news feed. 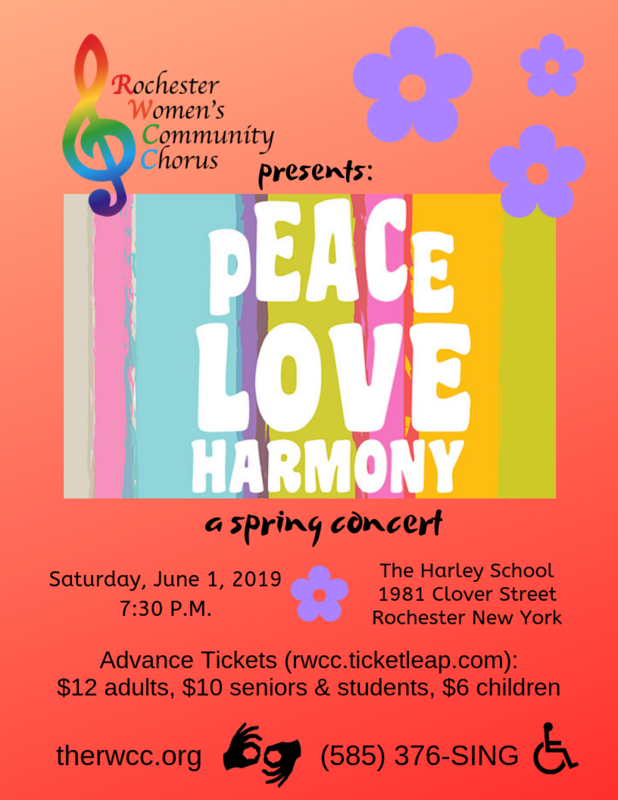 Our upcoming Spring Concert will be held on Saturday, June 1, 2019, 7:30 p.m. at the Harley School. For more details, see our Concert page. Copyright © 2001- Rochester Community Women's Chorus, RWCC. All Rights Reserved.